My friend and I enjoy the rooftop because we can see the ocean from there. Very nice staff. Beautiful old building. My room was very clean (and they upgraded me for free which was very kind). Good breakfast on the roof terrace. Overall great value for money. 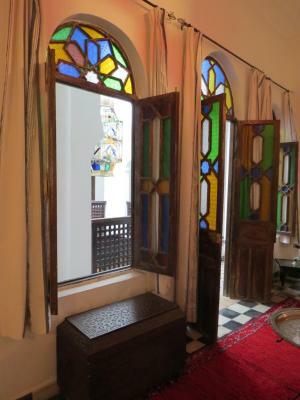 This was our first time in Morocco and our first Riad. The location was a bit difficult to find initially, but once you found it it was incredibly easy to find again. The staff were excellent and very helpful. 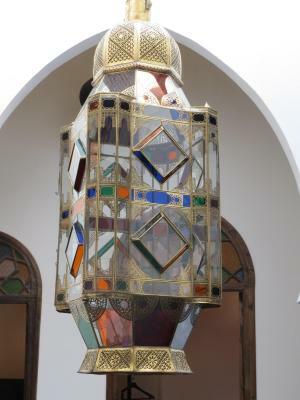 The food was exceptional, and having a terrace breakfast and watching the sunrise over Tangier was magical. The property was warm (stayed in December) and very clean. It also smelt amazing. This was a super unique stay in Tangiers. 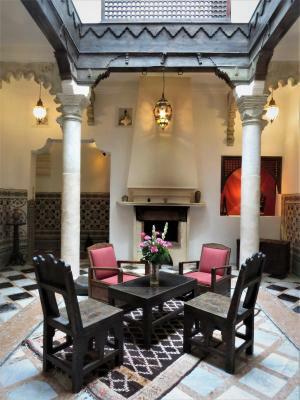 Beautiful old home, more like an inn deep in the middle of the medina, I think that is the right word. Super nice owner and staff. This place is not what the average American is used to so if that is what you are looking for I would suggest just a regular hotel. He enjoyed it very much. Rashid was the most hospitable staff ever!!! He showed me around the Medina which can be very confusing. He also gave me the best recommendations for places to eat. Thanks so much Rashid!! Beautiful terrace. 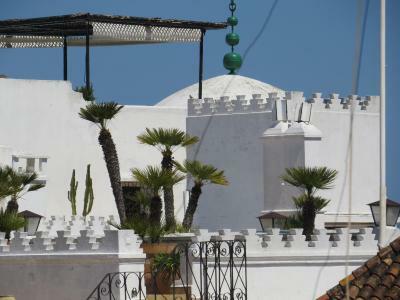 All the riads we chose in Morocco had rooftops. Arous Chamel without a doubt had the best one! We had an amazing breakfast with an awesome view over the city and the beach. Quite yet energetic place which was absolutely worth the money. Very kind staff and a great atmosphere. Highly recommended! 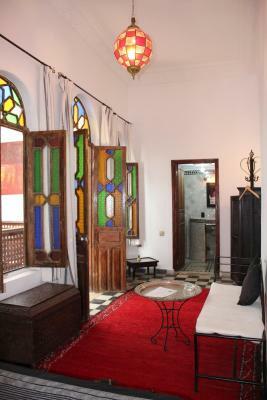 This Riad is right in the heart of the medina - which is a blessing and a curse for foreign visitors. 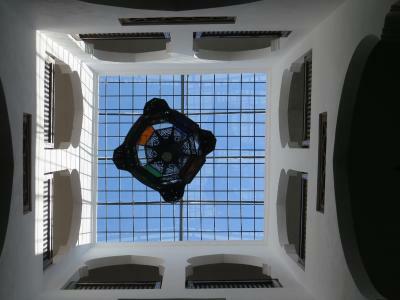 (Right where you want to be - but terribly confusing to re-locate) Neat architecture and helpful staff. Very helpful manager, good position, excellent breakfast in the terrace. 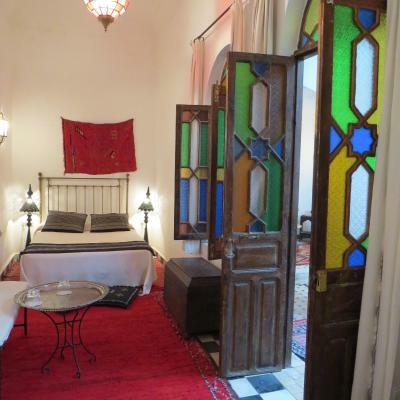 This Riad is spectacular, a piece of history. 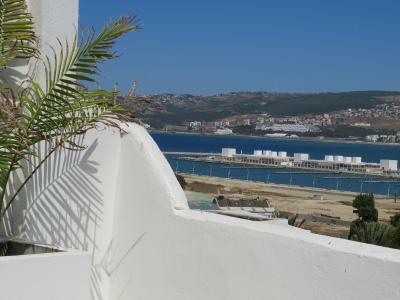 Good position to get the port Tanger Ville (15 minutes walking), and 10 minutes from the Salon Bleau and the Bab Al Bahr, the door with sea view. 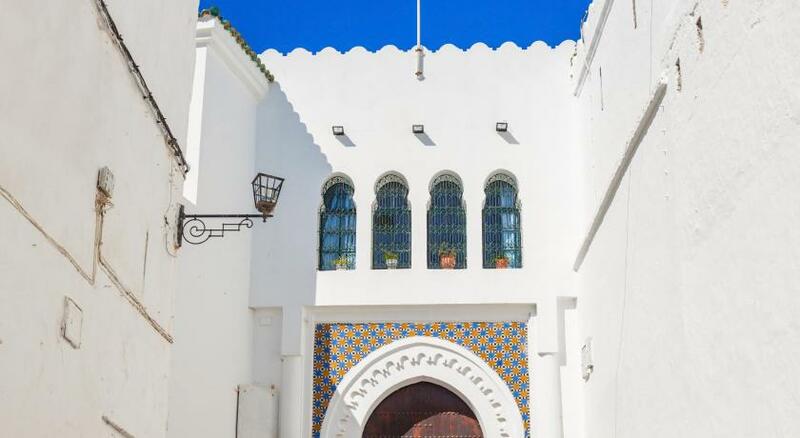 One of our top picks in Tangier.Located in the heart of the Tanger Medina, this Riad hotel is a 2-minute walk from the beach. 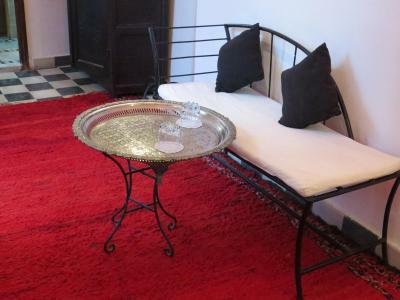 It offers rooms with private bathrooms and free Wi-Fi in the reception area. 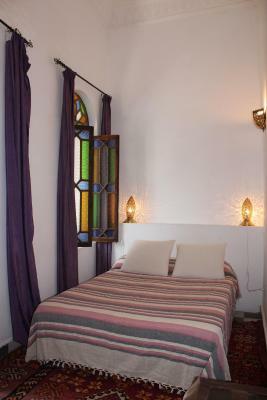 The Riad Arous Chamel has a large sun terrace, which offers a panoramic view of the bay. A full breakfast buffet is served daily. 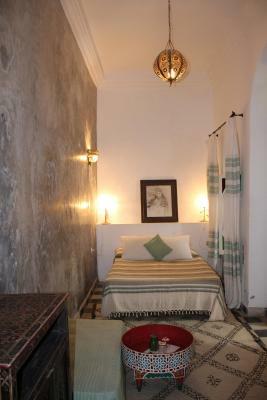 The Riad Arous Chamel is 2 miles from Tanger train station. 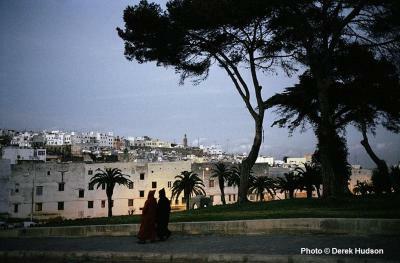 It is also a short walk from the Old Port and the Mendoubia grounds. 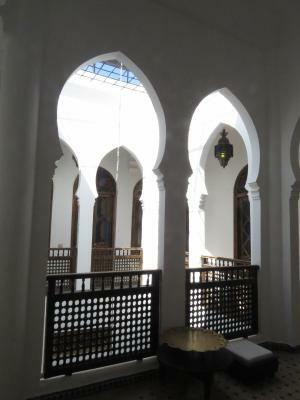 Old Medina is a great choice for travelers interested in markets, old-town exploration and culture. 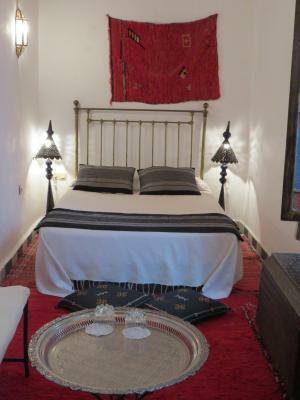 This is our guests' favorite part of Tangier, according to independent reviews. 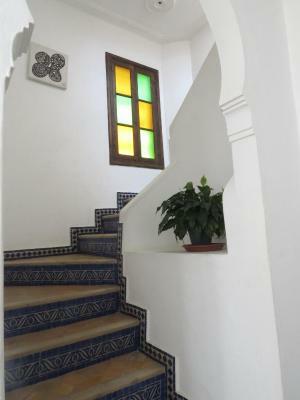 뀐 Located in the real heart of Tangier, this property has an excellent location score of 8.2! 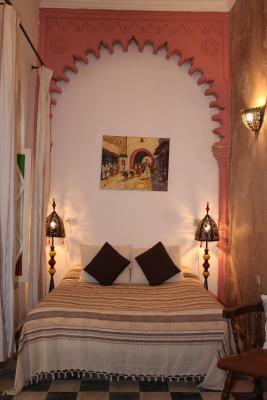 When would you like to stay at Riad Arous Chamel? 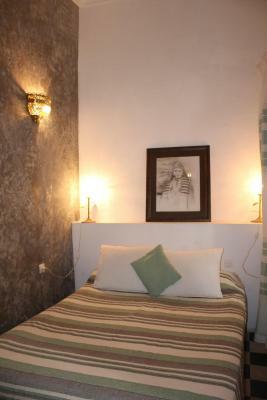 This room offers an private bathroom with complimentary toiletries. Please note that the private bathroom is not inside the guest room, but located on the same floor. 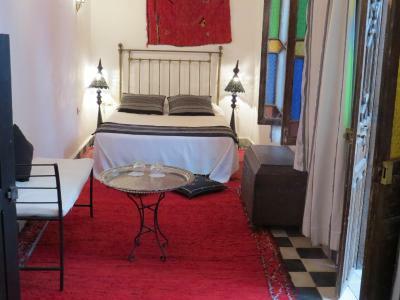 This house is an annex located 5 minutes' from the riad and features two bedrooms, a private bathroom, an equipped kitchenette and a terrace with views on the sea. Area Info – This neighborhood is a great choice for travelers interested in markets, old-town exploration and culture – Check location Great location - show map Guests loved walking around the neighborhood! 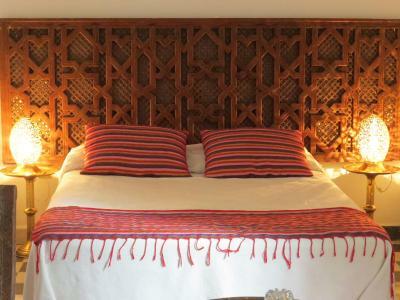 House Rules Riad Arous Chamel takes special requests – add in the next step! 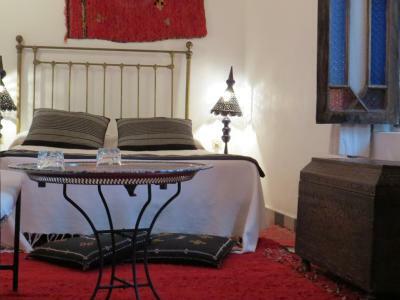 Riad Arous Chamel accepts these cards and reserves the right to temporarily hold an amount prior to arrival. The bedroom that we got is on the ground floor, it is damp and smelly from the bathroom, and sometimes the water didn't leak. When we're in our room and in the rooftop, we can't get the wifi signal. Also, it is kind of dark on the ground floor. Bottle of water on arrival. 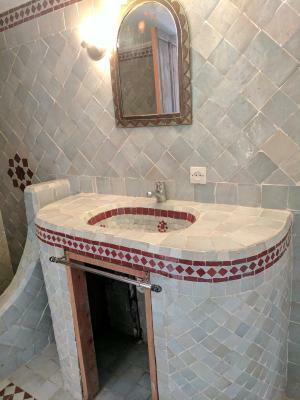 Hand shower in bathroom. Some breakfast options like eggs. A extra glass of juice on the house would have been nice. Staff was very helpful and nice. Roof top lovely view. Nice to sit out. Walking around in the old city after dark can be a bit nervewracking. It’s kind of hard to find the location but some old ladies kindly helped me. There aren’t enough breakfast tables which I found kind of hilarious. 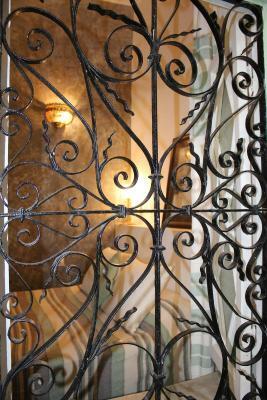 The hotel interior is amazing due to most of the original features have been kept, the breakfast in the terrace is a must! The food is delicious. I would recommend that they provide information on where to park when you arrive. We came by car and had an issue at 12:30 am because we apparently parked in the wrong place, we then paid a parking guard to find the next morning we needed to pay again then when trying to leave got bombarded by the other parking people saying we needed to pay. Breakfast was lovely and the little rooftop is nice. A little be more maintenance would have been nice. A friendly host and staff. 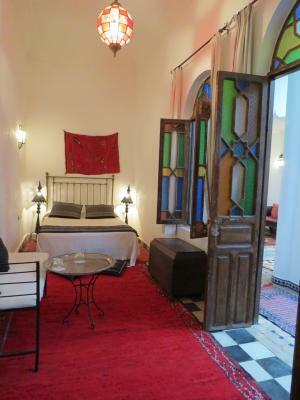 A charming old Riad. Can’t really get any receptions in the room, maybe just my provider and wifi was also unavailable within my room (I had to go upstairs for better connections) but that wasn’t a big problem. Staff was very friendly. 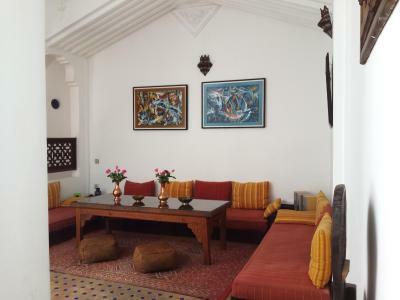 Rashid was very welcoming on my arrival and told me everything that I needed to know about the property. Also Adnan was very polite and friendly as well, he also made sure everything was running smoothly. Oh and they have amazing rooftop terrace where they serve the breakfast and yes you’ll be able to ask for more coffee!! Our private bathroom was appart from the room (even not on the same floor). A shower was broken. 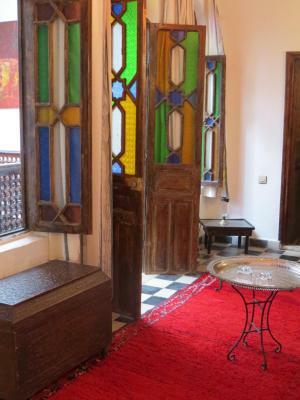 Inside riad the smell was not good (old wood smell). 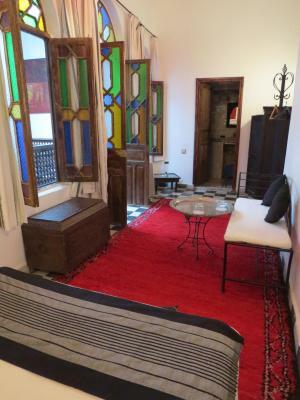 And it seemed that owner doesn’t care about his riad - interior is authentic, but definetely needs for a restauration. The bed cover wasn’t clean. 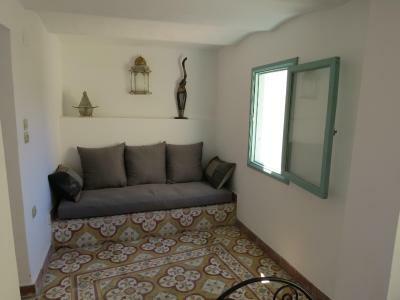 Nice terasse. Staff nice and helpfull. 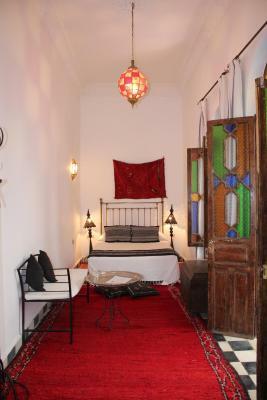 A lovely riad in the Tangier Medina that provided comfortable accommodation in the heart of the Medina. 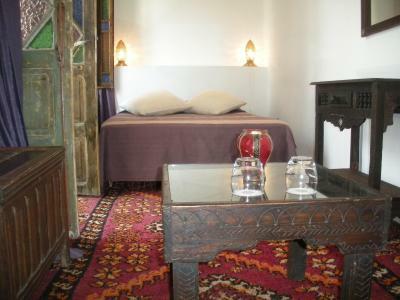 The interior was tastefully done with authentic moroccan rugs and trimmings. It was very clean and the staff were friendly and very helpful. 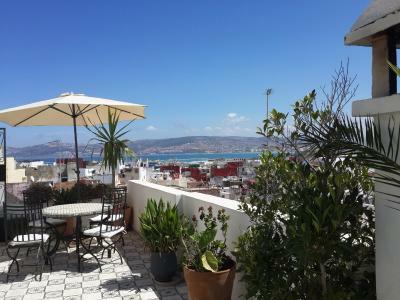 The rooftop terrace was a delight with views over Tangier and the sea. 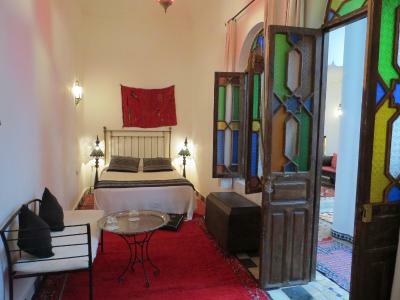 Bathroom was separate from the bedroom, on the same floor but on the other side of the riad which isn’t very comfortable especially in winter when it gets cold. 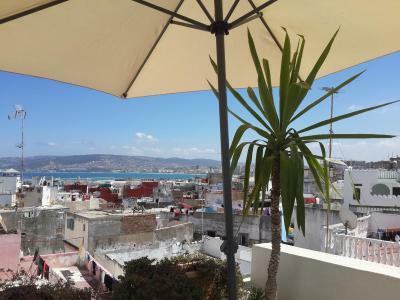 Nice riad in the medina of Tanger, super nice terrasse/rooftop where you can have breakfast in the morning. The breakfast is enjoyable. The room is basic but it’s good money for value. We cross path with the owner who’s quite caring of your comfort which is nice. 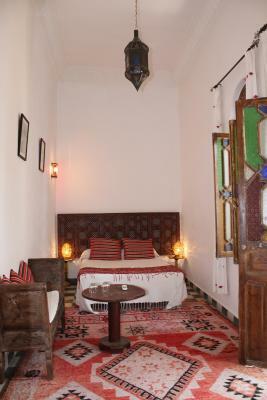 We went in December and the riad was quite cold. The breakfast on the terrace was amazing each morning. The ocean is visible from the terrace and very peaceful. 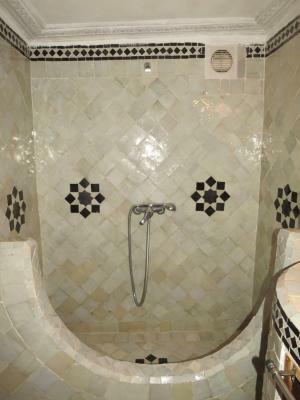 The room was comfortable and the bathroom was amazing, very nice hot showers. Rashid was very helpful with recommendations as to where to eat and also helped us with booking some activities. 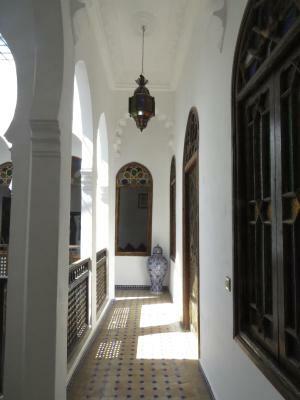 He even walked us to locations and he greeted us at the riad with moroccan tea. 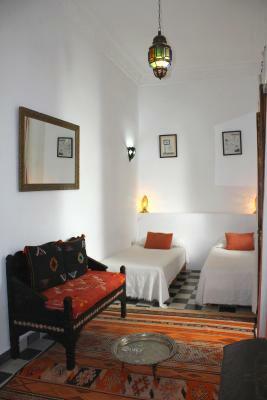 Lots of privacy with quietness at this riad. Would highly recommend! Private bathroom was accessible to other guests. After being out all day, we returned to no toilet paper. Better sign for hotel would be good, easy to miss the front door. Location was great and roof terrace was lovely. 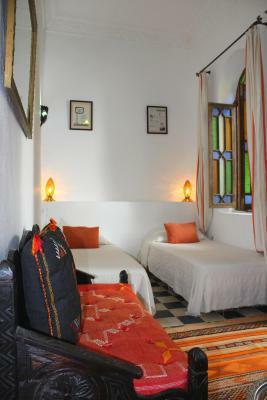 Typical Moroccan riad with very hospitable staff.